We have a waiting list - Please complete the form "Questions about Wycombe Juniors" at the very bottom of this page if you would like your child to be considered should a place become available - Places will be offered on a first come first served basis. ﻿A club for juniors aged 8 - 16 years. The club is a perfect next step if you have taken one or more of our introductory courses (Little Smashers for 5-7 year olds and Big Hitters for 8-11 year olds) or have enjoyed playing badminton at school. Sessions offer a mixture of coaching and games provided by a BADMINTON England registered coach. 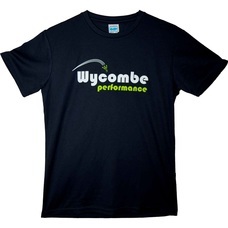 Every child will be provided with a free high quality sports T-shirt when they join Wycombe Juniors. If you would like further information about the Club, please contact reception by phone (01494 436200) or by using the contact form at the bottom of this page. Sizing information is available and you will be asked to confirm what size of t-shirt at the time of booking. Questions About Wycombe Juniors Badminton Club?